So let us explicate: faith in divine unity has four stages, and may be divided into its core, its innermost core, its shell, and what contains its shell. To accommodate weak understandings, let us liken this to a nut within its husk: for there are two shells, and a core, and the innermost core contains oil. Laptop: The main computer device I use is a laptop. As you can see, pretty much all data flows away from it. It is the primary device which always contains the most recent files and is authoritative in case of version conflicts. Time Machine: The laptop in its entirety regularly receives a versioned backup. Since I am on Mac OSX, the backup software I use is Time Machine, an Apple-made product. I use a 1TB external hard drive for this backup (the laptop has a 500GB Solid State Disk). A backup is ‘versioned’ when it not only dumps the latest backup onto the external HD, but keeps older backups as well, as far as the HD has the capacity for. It means that I can not only jump back in time to the last backup, but also to one backup before that, or many more earlier versions before that. If the screwup you are trying to fix is also present in the last backup, you just go back far enough for the screwup not to exist. Using Time Machine I backup my entire laptop except my ‘Downloads’ folder. Everything in ‘Downloads’ either sits there to be consumed once and then deleted, or to be properly archived. Dropbox: A number of folders, those which pertain directly to my current teaching and research projects, are synchronized with ‘the cloud’, in my case Dropbox. Dropbox probably does not need introduction. Note that traffic between laptop and Dropbox is two ways. Covers about 5 to 10GB. SD Card: SD Cards are super small and handy, I find. I have a 128GB one, which I try to plug in every time I use the laptop. Every time I am done, I take it out and put it in my wallet. The files that are on it are threefold: those same files as on Dropbox, research sources permanently present on my computer, and older teaching and research projects. Integrating the SD Card was the last step I added to make my strategy more in line with al-Ghazālī. I will explain more about it in a future post. External HD: My 2TB external hard drive contains all my research files. Primary sources, secondary literature, notes, documents, etc. The whole lot is divided into two parts: those which are also on my laptop and those which are not. Those which are, are kept in sync. I currently use the software called ChronoSync, which I hope to explain later. Updated every one to two weeks. External HD Mirror: This is a 1TB external HD that is mirroring the previous external HD. The reason to have two is because the previous HD has some files that are not on my laptop, so this way I have them twice. Keeping them in separate places (office/home or travel/home) allows for a safety net in case one of the two gets hurt. The hard disks are of different brands. This 1TB disk is the older one. When the files on the first disk total more than 1TB, I will replace this one for a 2TB disk and repurpose this one. 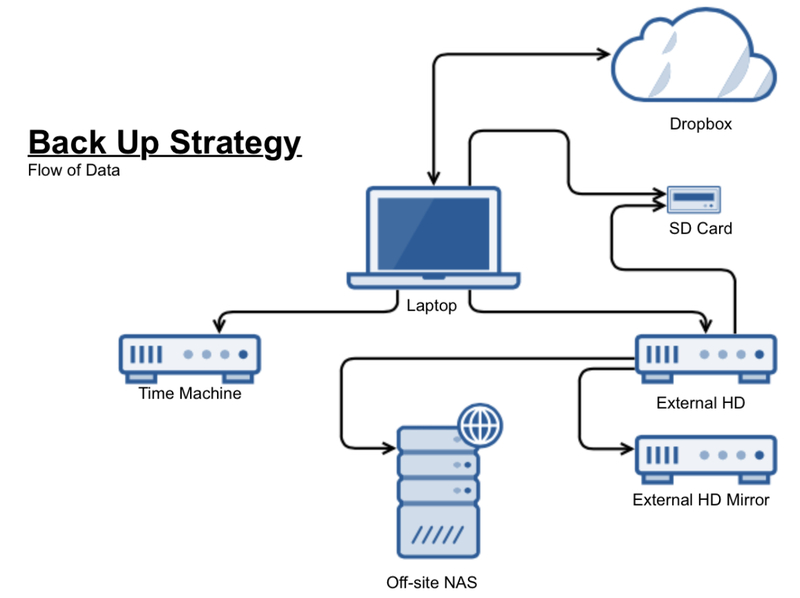 Off-site NAS: NAS stands for Network Attached Storage-unit. It is an entirely different beast than an external HD, as it is basically a computer in its own right, but one optimized to store files. Currently, I use a private unit and I am lucky enough that it is not only off-site, but literally on a different continent. This unit contains all of the above, but is only once or twice a year updated. 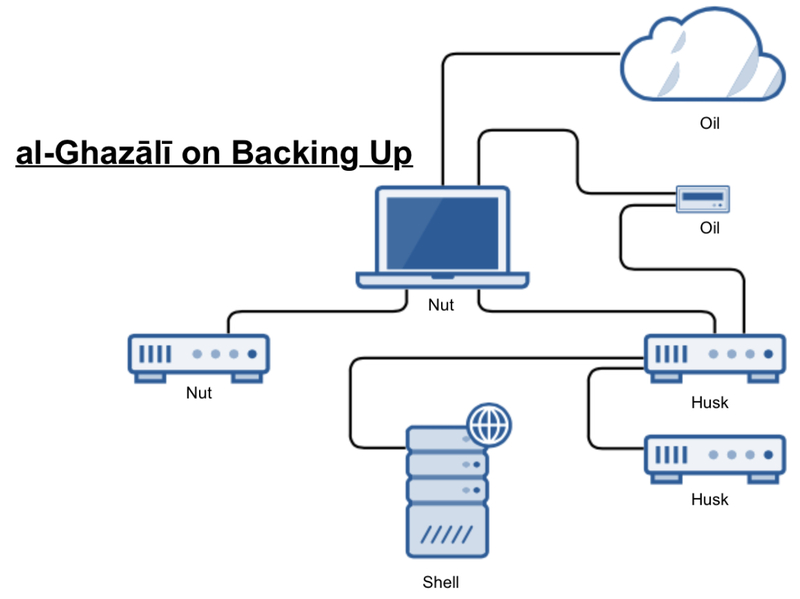 This diagram in fact does not speak so much about backing up, as it does about archiving. Every term represent a different set of files, with different levels of being mission-critical. Oil are those files I am currently working on and are produced by myself. No one but me knows (or cares) they exist. Nut are all oil files, plus those sources that are highly permanent to my work and which I use frequently, in my case primary sources and secondary literature on Islamic philosophy. Husk are all nut files, plus those sources which could be useful but which I definitely do not often, in my case literature on other subfields of Islamic Studies, and adjacent fields such as History of Philosophy and Medieval Studies. Shell are all husk files. As we can see in the diagram, each stage is doubly executed, allowing for a certain measure of safety. If you want to mix in your private files (music, photos, videos, etc. ), I suggest to do it at the husk and shell stages. At the moment, I think this amount of effort is good enough for a simple student or scholar. By no means is this a watertight system, but if I lose my files, I can safely say I did my best. Let me know what you think in the comments. I recently implemented cloud (outside Egypt) backup to Amazon’s cheaper Glacier storage with Arq. Normal documents synced easily. My TBs of images are taking more time. It saves money since the retrieval process is slower. But as a last line of defense it is great. Hope I never have to use it.